Bodie is located in the Basin Range of the Eastern Sierra Nevada Mountains, about 13 miles East of Highway 395 in central California. Take U.S. Hwy. 395 to State Hwy. 270 and drive 10 miles east until the paved road ends, then continue for 3 miles of an unpaved dirt road. Be sure to stop for gas in Bridgeport or Lee Vining (depending on which direction you are coming from)before you going to the park. There are NO services near Bodie. Stop for food and enough supplies for a day of hiking. Here are some suggestions of what to take for a day in Bodie. 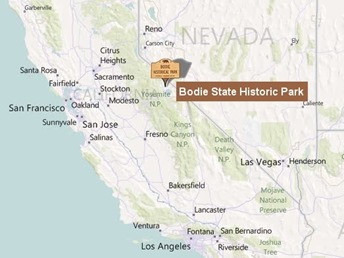 You may also want to book a reservation nearby, to camp or get a room since you could easily spend four or five hours in Bodie (plus travel time). The elevation will wear you out faster than you may be use to, so plan to stay the night nearby.